An Aberdeenshire school was evacuated yesterday as emergency services investigated reports of a chemical leak. Classes at Aboyne Academy were stopped as a major incident was called and emergency services descended upon the campus. Senior fire officers called for the school, which provides education to 696 pupils, to be emptied. Children were held outside for a short time as investigations began and specialist fire-fighters in hazmat gear entered. Many youngsters had to abandon belongings in their classrooms, with initial suggestions of a smell “like sewage” being followed by concerns over a chemical spill. It was eventually concluded that a sewage problem had caused the smell, but by then pupils had already been sent home. Senior management called in the alert to the emergency services after a concerning stench began to emanate from a cleaning cupboard. A senior staff member last night confirmed that there had been no injuries and that the contents of the cupboard had been examined, removed, and placed outside on the front lawn of the school grounds as a precaution. They said: “We had at first suspected a chemical leak. “It first smelled like sewage, but then we decided to phone the fire service to investigate as we began to think it might be more serious as it had a sulphurous odour. “The pupils carried out a Stay in Place procedure and remained in their classrooms, but when the fire service arrived, they advised us to evacuate the whole school. “We did so as if it were an emergency situation. “Children were asked if they had keys to their homes. Some children were unable to return to their classrooms to retrieve their belongings and one pupil was visibly upset at being told he would have to leave his bag and mobile phone behind. Five fire appliances, including a specialised hazardous materials (HAZMAT) unit used by fire teams to detect, identify and monitor dangerous substances attended at the school. The 28 fire-fighters arrived at about 10.40am and remained until 2.25pm. 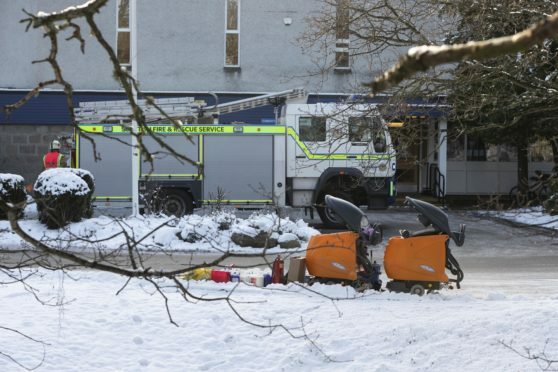 A spokesman for the Scottish Fire service said: “We were called out to investigate an unidentified smell or sulphur issue at Aboyne Academy. “We checked out the area around the cleaning cupboard, but could see no sign of any spillage or leaks. An Aberdeenshire Council spokesman last night said: “Aboyne Academy and Community Centre were evacuated on advice from the Fire Service who were investigating the source of a suspicious smell. “The school closed for the rest of the day as a result.